Do you really understand what is magic? Or have you ever experienced magic? A question that always on our mind when we see those magical movies, or even the magic of a magician. On my side, not only magician or even those magical movies can perform magic. The thing is, we all can have or perform magic. Magic is defined as unexplainable things or happenings. So I said that even a simple person or we all can have or feel magic, it is because we all can feel love and be loved. Love is really unexplainable. Even you, did you ask your self why did you love that person? And do you think you get the correct answer? Well if you answer because he/she is beautiful or handsome or some any reason well that is not love. On my side true love is unexplainable or it is magic of Life that comes in every person. That is why when my girl ask me why did I love here? I only smile and said I don't know, it is because I can't explain the reason or there is no reason. I just feel it for any no reason. And the best example of magic is our God, why? because only God can love Us unconditionally and for no reasons. He just Loved Us, the way we are. No buts, no whys'.Also He gave His magical Love when He sent His only Son to save all of Us. And that Is really a magic. So the best describe of magic is love and love is God. So Let Us all feel the magic of love, share it, and be loved. hope this inspire to all of Us. LOve has no reason, it doesn't have a beginning so it doesn't have an ending and that is the real magic. Did I say it right? well http://gagbox.blogspot.com/ says "it's always right"
I absolutely agree that God is love. But love is magic, I won't. God's love is real. And it is best described in the Bible, that says: "For God so loved the world, that He gave His Only Begotten Son, that whatsoever believeth in Him shall not perish, but have an everlasting life." And this pure love of God is fulfilled by Jesus Christ who died on the cross to redeem mankind from their sins. I really don't believe in magic. But I believe in love :) have a great week end ser. I totally agree with you that God is love because he never ceases to show his care and love for all of us! mmmh. i don't exactly agree with the word magic as it is affiliated with a bad image, like black image or magic tricks. just like saying "good luck" instead of "God bless" both have differences. I am not religious at all. But I believe in God, I believe in Love. 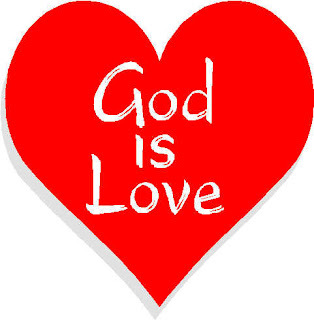 God is love. I'm sorry I don't agree with the word magic. It doesn't make sense to me. God Bless you! Love is what the Lord showed to us even we fell short of His glory.